Carnival Cruise Line has expanded its cruises to Cuba with the addition of 23 three- to five-day sailings to Havana in 2019-20 aboard five different ships departing from four East Coast homeports — Carnival Sunshine from Charleston, Carnival Triumph from Fort Lauderdale, Carnival Paradise from Tampa and Carnival Victory and Carnival Sensation from Miami. The 3,002-passenger, 102,853-ton Carnival Sunshine will be the largest cruise ship to ever call in Havana while offering the first-ever cruise to Cuba from the Port of Charleston. These new sailings complement previously announced voyages aboard Carnival Paradise and Carnival Sensation. Carnival Sunshine (Charleston): a four-day cruise with a day-long call in Havana departing Nov. 21, 2019, along with eight five-day cruises featuring Havana and Freeport departing Jan. 6, Feb. 3 and 17, March 2, 16 and 30 and April 13, and 27, 2020. Carnival Triumph (Fort Lauderdale): eight five-day cruises featuring an overnight call in Havana and a day-long call in Nassau departing Dec. 14, 2019, and Jan. 11, Feb. 8 and 22, March 7 and 21, and April 4 and 18, 2020; and a five-day cruise featuring an overnight call in Havana and a visit to the private Bahamian island of Half Moon Cay departing Jan. 20, 2020. Carnival Victory (Miami): a three-day voyage with a day-long call in Havana departing Nov. 22, 2019. Carnival Sensation (Miami): a four-day cruise featuring an overnight call in Havana and an extended visit to Nassau departing March 19, 2020, along with two five-day sailings with an overnight call in Havana and visits to Freeport and Nassau departing Feb. 15 and 29, 2020. Carnival Paradise (Tampa): a five-day voyage departing Nov. 18, 2019, with an overnight call in Havana and a stop at Key West. “Cuba has proven to be extremely popular with our guests and we’re delighted to provide even more opportunities to experience and explore this fascinating destination with these new voyages departing from four key East Coast homeports, including the first Cuba cruises from Charleston,” said Carnival president Christine Duffy. Onboard, a variety of Cuban-themed activities and entertainment, Havana-inspired deck parties, trivia contests and salsa lessons, are also offered. The visits to Havana comply with regulations of the U.S. Department of Treasury that permit travel operators to transport approved travellers to Cuba to engage in activities as defined by the U.S. Department of Commerce, Office of Foreign Assets Control. 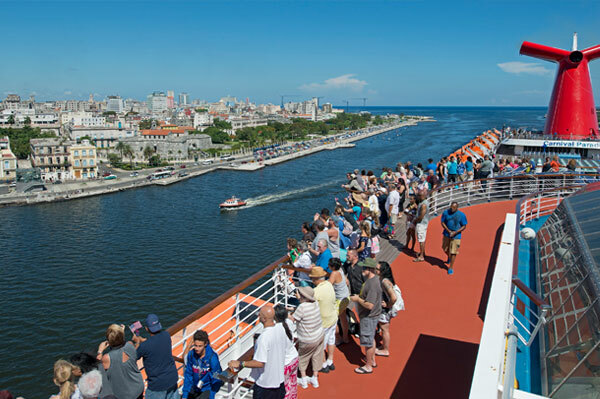 Carnival’s shore excursions meet all U.S. government regulations and provide a convenient means for complying with the people-to-people requirements of cruises to Cuba.